It is now known that many of the famous megaliths of Cusco and the Sacred Valley of Peru were made thousands of years prior to the existence of the Inca. Their elongated skull relatives of the coast of Peru may have been not only ancestors, but also immigrants from a different continent. 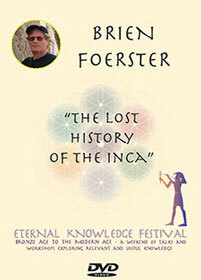 Brien explores the pre-Incan cultures of South America and the true origins of the Inca Empire. After completing an Honours Bachelor Of Science degree, Brien decided to take up carving and sculpture full time, at the age of 25. In 1995 he moved to Maui, Hawaii, and was hired as assistant project manager for the building of the 62 foot double hull sailing canoe ( ancestor of the modern day catamaran ) Mo’okiha O Pi’ilani ( Sacred Lizard That Pierces The Heavens. ) This project lasted 2 years. Peru became his next major area of interest. He is associated with Lloyd Pye of the Starchild project, who is analyzing the DNA of elongated human skulls of the Peruvian Paracas culture on his behalf.